To Cite: Kim S , Oh H Y, Ryu Y . Benign Phyllodes Tumor of the Breast Recurring as a Rapidly Growing Recurrent Malignant Phyllodes Tumor: A Case Report, Iran J Radiol. Online ahead of Print ; 16(2):e13062. doi: 10.5812/iranjradiol.13062. Phyllodes tumor is a fibroepithelial lesion that accounts for 0.3 % to 1.0 % of all breast neoplasms, and it is commonly observed as a fast-growing breast mass. Recurrences are frequent regardless of the histology, both in benign and malignant phyllodes tumors, and when it recurs, the prognosis is known as very poor. The average time to local recurrence reported is around two years from the initial excision. In this report, we describe a case of a benign phyllodes tumor of the breast recurring as a rapidly growing recurrent malignant phyllodes tumor in a 45-year-old woman, along with the imaging findings. There are many reports about recurrent phyllodes tumor in the medical field. However, the fascinating point about this case is the very short time interval of recurrences (shortest within one week) at the same location. To our knowledge, no case has been reported with such short interval time. Phyllodes tumors were originally described as “cystosarcoma phyllodes” by Johannes Muller in 1838. The term “phyllodes”, which means leaf-like, describes the typical papillary projections that are seen on pathologic examination. This tumor is classified as benign, borderline or malignant according to the World Health Organization (WHO) criteria. This classification is based on stromal cellularity, cellular atypia, stromal overgrowth, tumor necrosis and mitotic activity (1). These tumors occur mostly in women and only few cases have been reported in men (2). On physical examination, they present as a rapidly growing palpable mass with a smooth, well-defined margin. Palpable axillary lymph nodes (LNs) are encountered in 20% of the patients, but less than 5% are detected as clinically positive nodes (3). The most common baseline studies for phyllodes tumor are mammography and ultrasonography (US). Imaging findings are variable, ranging from small to huge tumors occupying practically the entire breast. On mammography, a phyllodes tumor presents as an oval, round, or irregular shape high density mass with a circumscribed margin. 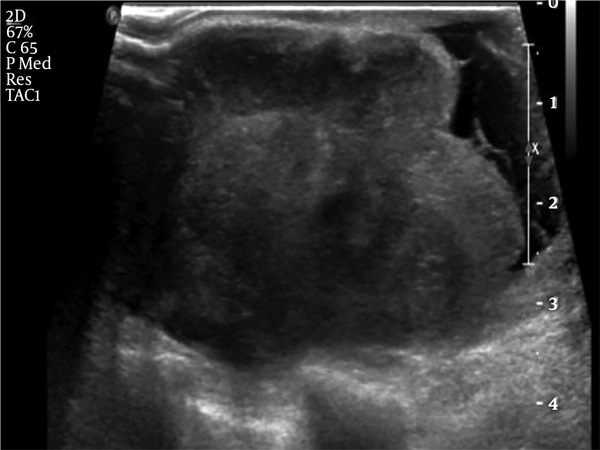 On US examination, a phyllodes tumor presents as a heterogeneous echogenic mass with a circumscribed margin that occasionally contains a cystic space producing posterior acoustic enhancement. Both mammography and ultrasonography cannot distinguish between benign, borderline and malignant phyllodes tumors, and therefore, pathologic confirmation is mandatory. We report a case of a benign phyllodes tumor of the breast recurring as a rapidly growing recurrent malignant phyllodes tumor in a 45-year-old woman, along with the imaging and pathologic findings. The fascinating point about this case is the very short time interval of recurrences at the same location. A 45-year-old woman visited Kangwon National Hospital due to 4 cm and 1.6 cm sized masses in her left breast. The patient had no personal history of any other cancer, had never used hormone replacement therapy and was multiparous. After simple excision, pathologic diagnosis was benign phyllodes tumor and fibroadenoma. Resection margin was clear (0.1 cm). Two years later, the patient revisited due to a huge tender mass in the left lower inner breast. On physical examination, she had a firm, rubbery, protruding and hardened palpable mass measuring about 20 cm × 18 cm in size in the left breast. There were many engorged veins throughout her left breast and the skin was stretched over the mass with ulceration and dimpling. Her right breast and both axillae examination showed no abnormality. Since the mass was firm and extremely large, we were unable to perform mammography. 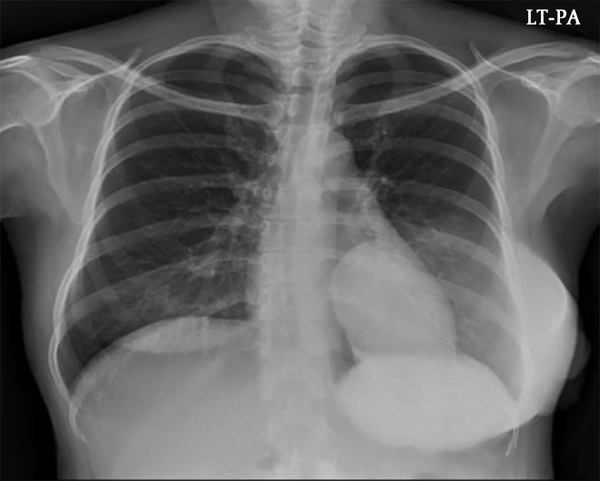 Chest X-ray at admission showed a huge hyperdense mass in her left breast (Figure 1). US examination showed a huge mass which encompassed the entire left breast with heterogeneous echogenicity and a non-circumscribed margin (Figure 2) which was classified as Breast Imaging Reporting and Data System (BI-RADS) 4C and an US-guided core biopsy was performed. Significantly enlarged lymph nodes were not observed on US. The result of core needle biopsy revealed a malignant phyllodes tumor and the patient underwent radical mastectomy. During operation, invasion into the pectoralis major muscle was noted. The final postoperative histopathology examination results were as follow: on gross examination, the cut surface of the tumor showed multinodular appearance, with multifocal hemorrhage and necrosis (Figure 3A). On microscopic examination, multifocal malignant phyllodes tumor areas measuring 3 cm in greatest dimension were seen in the background of benign phyllodes tumor measuring 20 ×18 × 12 cm in size with pushing border (Figure 3B). Epithelial component were scanty and densely packed (Figure 3C). Hypercellular stroma, cellular atypia, and high mitotic figures (>20/10 high power field [HPF]) were seen (Figure 3D). Resection margin was involved by benign phyllodes area. Two weeks after discharge, she was again admitted to our hospital due to fever and a progressively growing mass in her left resected breast. Follow-up US revealed a large mass with a complex cystic and solid echo pattern in the operative bed of the left breast with diffuse skin thickening and edematous change (Figure 4). Enlarged lymph nodes with preserved fatty hilum were seen in the left axillary area. We assessed the lesion to be a recurred phyllodes tumor or considered the possibility of an infectious condition. The surgeon decided to perform reoperation without a core-needle biopsy. Contrast-enhanced abdominal computed tomography (CT), chest CT and a positron emission tomography (PET)-CT were performed to evaluate the extent of this mass prior to surgery and for metastatic workup. On abdominal and chest CT, no evidence of metastasis was noted, and on PET- CT scan, there were hypermetabolic lesions along the left anterior chest wall around the previous operation site, suggesting a postoperative change. However, it was impossible to perform the operation immediately due to the liver function abnormality and the operation was postponed until 1 week. The reason for the liver dysfunction that we suspect is graviola tea which the patient drank without the permission of the physician. We believe this tea caused toxic hepatitis and elevated liver function test (LFT) was noted since the liver function improved after she stopped drinking the tea. Finally, the patient underwent a debulking operation for the recurred mass and the mass was found to be very hard and it extended to the axillary area (level I) with multiple invasions into the left ribs and a fixed state to the chest wall. Because of severe adhesion to the surrounding soft tissue and chest wall and massive bleeding, the surgeon could not completely resect the tumor. The wound could not be closed due to skin tension. The left breast mass weighed 550 g at the time of excision with involvement of resection margin. The resected mass also showed necrosis and ulcerative change and the cut surface showed whitish appearance and infiltrating border. The final pathology examination of the debulking surgical specimen revealed high cellularity, nuclear atypism, and a high mitotic rate (Figure 5). Involvement of the resection margin was noted with invasion to muscle and skin. Tumor necrosis was noted in both operations, but no lymph-vascular invasion and perineurial invasion was noted. Figure 5. A, Gross specimen of the recurrent malignant phyllodes tumor (2nd recurrence, 3rd operation) with necrosis and ulcerative change. B, Cut surface shows whitish appearance and infiltrating border. C, Hypercellularity, cellular atypism, high mitotic rate (H&E staining, × 400). One week after the debulking operation, during wound dressing, the surgeon grossly noted multifocal masses in the operative bed. Nevertheless, she received no adjuvant chemoradioation after the first recurrence because her general condition was poor. The second debulking operation (3rd recur, 4th operation) was performed and multifocal masses were found throughout the entire left breast including the left axilla. Pathologic finding was similar to the 3rd operation, entire malignant phyllodes tumor. Because of rapid recurrence of the mass with a poor patient condition, the surgeon decided that the masses were no longer resectable and palliative radiation therapy was planned. One cycle of palliative radiation therapy (1.3 Gy × 2 fractions/day × 7 days) was performed and enhanced chest CT was performed after completing radiation therapy (RT) (Figure 6). On chest CT scan, there were multiple variable sized high attenuation masses in the left breast operative bed extending to the left axilla and the contralateral side of the breast. Figure 6. Chest CT scans obtained after the second debulking opertation. 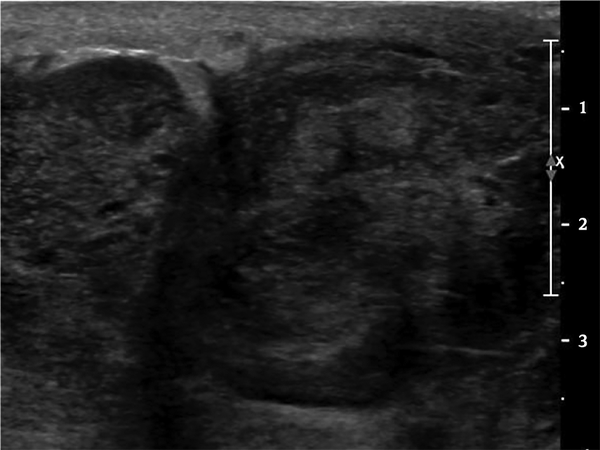 Multifocal variable sized enhancing masses are noted in the left operative bed that extended to the left axilla (A) and contralateral side of breast (B). The disease gradually progressed to pulmonary edema and malignant pericardial effusion, and she expired in hospital care within 4 months of her first recurrence. Phyllodes tumor is an uncommon fibroepithelial breast tumor that accounts for 0.3 % to 1.0 % of all breast neoplasms, and it is commonly observed as a fast-growing breast mass. It usually occurs in middle-aged women between 45 to 49 years of age, and this age group is 20 years older than than that for fibroadenoma (4). The clinical course of phyllodes tumor is unpredictable and it is difficult to differentiate between phyllodes tumor and fibroadenoma by imaging and even cytology. Aspiration cytology is unreliable because of inhomogeneity of the tumor. For this reason, both permanent sections and intraoperative frozen section should be obtained for an accurate diagnosis. Core needle biopsy is the common first step to differentiate between phyllodes tumor and fibroadenoma. Komenaka et al. (5) have reported that core needle biopsy represents the preferred means of pre-operative diagnosis for giant breast tumors with a sensitivity of 99% and a negative predictive value and a positive predictive value of 93% and 83%, respectively. However, many physicians insist that when clinical suspicion persists after core needle biopsy, excisional biopsy should always be considered (6). When the diagnosis is made, surgical excision is the treatment of choice. A wide surgical excision with a 1 to 2 cm margin is recommended, and when an inadequate margin is obtained, an increase in the risk of local recurrence and distant metastasis has been reported (1). In our case, when we first excised the benign phyllodes tumor and even when she revisited our hospital due to recurrence, we clearly checked the tumor-free resection margin, but repetitive local recurrences occurred. Recurrences are frequent regardless of the histology, both in benign and malignant phyllodes tumors, and many studies have found that time to local recurrence is shorter in patients with malignant phyllodes tumor compared with patients with benign and borderline phyllodes tumor. The average time to local recurrence reported is around two years from the initial excision and it indicates that more careful observation and follow-up are needed within two years after surgery (7). In our case, the patient noted a palpable mass within 19 months after surgery and had not undergone imaging or outpatient department follow-up after surgery. Once recurrence occurred, the time interval between the recurrences shortened as the second recurrence occurred about 1 month after surgery and the third recurrence was noted within 1 week after the previous debulking operation. It has been reported that recurrent tumors grow rapidly in a short time period as compared with the initial tumor and outbreak at the original operative site (7). Several case reports reviewed and documented the ability of benign tumors to undergo malignant transformation. Tan et al. (8) reported that 18.9% of the patients with an initial benign phyllodes tumor developed recurrent borderline or malignant tumors and Barrio et al. (9) reported that 26.1% of the patients have the same characteristics. In our case, the initial mass was a benign phyllodes tumor, but when it recurred, multifocal malignant tumors were noted in the background of a benign tumor. Some authors have reported a malignant tumor recurring as a benign or borderline tumor, and this indicates that whatever the initial histology may be, surgical excision is recommended. The treatment of choice for local recurrent tumors is re-excision to achieve a wide margin or mastectomy followed by radiation therapy. The need for additional local treatment, such as RT, is still not established. However, for a patient with locally unresectable tumors, like our case, palliative RT would be an option. A multi institutional study performed by Barth et al. revealed that the local recurrence rate after adjuvant radiotherapy was significantly less than that observed in the reported patients treated with margin-negative resection alone (10). There are no prospective randomized trial data regarding the best treatment for recurrent phyllodes tumors. Therefore, a well-designed prospective study is needed as soon as possible. In conclusion, a phyllodes tumor has a wide range of spectrum with high prevalence of local recurrence and capacity for metastasis. To the best of our knowledge, none of the reported cases have shown such a short interval of recurrence as our case. Local recurrence usually occurs within two years of initial surgery, and therefore, a careful follow up is recommended within two years and guidelines for the treatment of a recurrent phyllodes tumor are urgently needed. Authors' Contributions: Ha Yeun Oh and Soo-Hyun Kim wrote the manuscript and reviewed/presented all radiologic images. Young-Joon Ryu reviewed all the pathologic slides and is responsible for the provided pathologic images. Ha Yeun Oh in charge of overall direction and planning. Funding/Support: This study was supported by 2014 Research Grant from Kangwon National University (No. 120140658). 1. Tan BY, Acs G, Apple SK, Badve S, Bleiweiss IJ, Brogi E, et al. Phyllodes tumours of the breast: A consensus review. Histopathology. 2016;68(1):5-21. doi: 10.1111/his.12876. [PubMed: 26768026]. [PubMed Central: PMC5027876]. 2. Reinfuss M, Mitus J, Duda K, Stelmach A, Rys J, Smolak K. The treatment and prognosis of patients with phyllodes tumor of the breast: An analysis of 170 cases. Cancer. 1996;77(5):910-6. [PubMed: 8608483]. 3. Mangi AA, Smith BL, Gadd MA, Tanabe KK, Ott MJ, Souba WW. Surgical management of phyllodes tumors. Arch Surg. 1999;134(5):487-92. discussion 492-3. [PubMed: 10323420]. 4. Schillebeeckx C, Verbeeck G, Daenen G, Servaes D, Bronckaers M. A giant phyllodes tumor of the breast. Rare Tumors. 2016;8(3):6299. doi: 10.4081/rt.2016.6299. [PubMed: 27746880]. [PubMed Central: PMC5064296]. 5. Komenaka IK, El-Tamer M, Pile-Spellman E, Hibshoosh H. Core needle biopsy as a diagnostic tool to differentiate phyllodes tumor from fibroadenoma. Arch Surg. 2003;138(9):987-90. doi: 10.1001/archsurg.138.9.987. [PubMed: 12963656]. 6. Lee AH, Hodi Z, Ellis IO, Elston CW. Histological features useful in the distinction of phyllodes tumour and fibroadenoma on needle core biopsy of the breast. Histopathology. 2007;51(3):336-44. doi: 10.1111/j.1365-2559.2007.02786.x. [PubMed: 17727475]. 7. Xiao M, Zhu Q, Jiang Y, Li J, Wang H, Zhang J, et al. Local recurrent phyllodes tumors of the breast: Clinical and sonographic features. J Ultrasound Med. 2015;34(9):1631-8. doi: 10.7863/ultra.15.14.11012. [PubMed: 26269294]. 8. Tan EY, Tan PH, Yong WS, Wong HB, Ho GH, Yeo AW, et al. Recurrent phyllodes tumours of the breast: Pathological features and clinical implications. ANZ J Surg. 2006;76(6):476-80. doi: 10.1111/j.1445-2197.2006.03754.x. [PubMed: 16768772]. 9. Barrio AV, Clark BD, Goldberg JI, Hoque LW, Bernik SF, Flynn LW, et al. 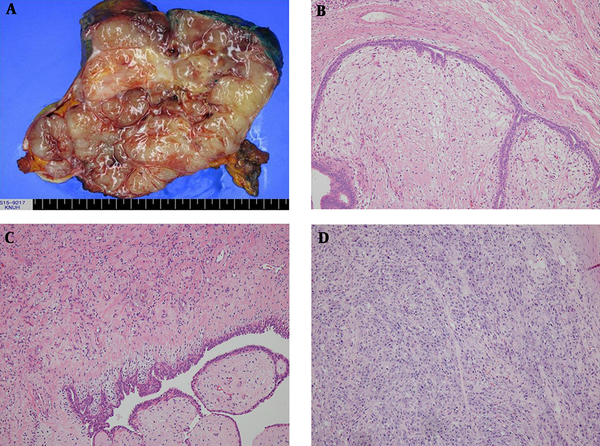 Clinicopathologic features and long-term outcomes of 293 phyllodes tumors of the breast. Ann Surg Oncol. 2007;14(10):2961-70. doi: 10.1245/s10434-007-9439-z. [PubMed: 17562113]. 10. Barth R Jr, Wells WA, Mitchell SE, Cole BF. A prospective, multi-institutional study of adjuvant radiotherapy after resection of malignant phyllodes tumors. Ann Surg Oncol. 2009;16(8):2288-94. doi: 10.1245/s10434-009-0489-2. [PubMed: 19424757]. [PubMed Central: PMC5053421].